Not many FIFA world cup fans know that the official name of the 2014 FIFA World match ball is “Brazuca” and not many know that the name was selected by Brazilians after an unprecedented voting frenzy on the internet. The “Brazuca” won by over a million votes, an overwhelming 77.8 percent ahead of ‘Bossa Nova’ (Popular Brazilian dance style) and ‘Carnavalesca’ (Someone who loves a carnival). 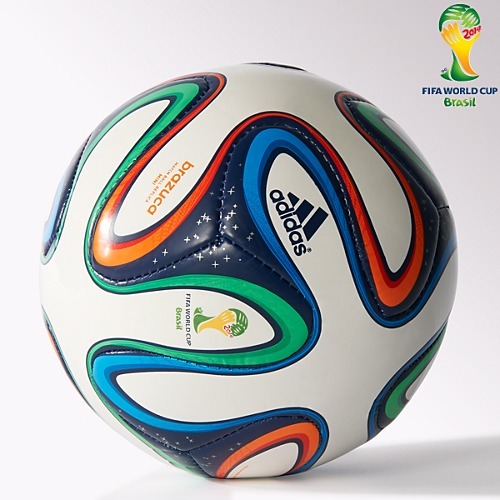 It is not surprising that the football loving nation chose “Brazuca”. Brazuca means “fella” and means “Brazilian” in some countries. Therefore “Brazuca” simply means “Brazilian”. Naming the official world cup “Brazilian” seemed like a natural progression of things. The soccer ball must be Brazilian; after all they seem to have domesticated the sport. The country has not only won the coveted trophy five times, It is the only country to have appeared in every tournament since its inception. Brazil is also the country that gave the world Edson Arantes do Nascimento a.k.a Pelé, widely regarded as the best player to have ever played the beautiful game. But by claiming the ball to be Brazilian, the Brazilians may have succumbed to hubris. “Hubris” which originates from ancient Greece means excessive pride or self-confidence which leads to action (s) or spoken word(s) that are offensive to God (s). Many heroes in Greek tragedies like King Oedipus were brought down by “hubris”. Some may think that calling the official world cup ball, “Brazilian” may be nothing egregious for a nation that has come to believe that “God is Brazilian” but a look at the successive names for the world cup balls may reveal that naming the world cup Brazuca might have been the most potent form of hubris. Adidas started making balls for the world cup in 1970 but it was in Mexico 1986 that the host nations started showing their influence on the physical ball. Mexico introduced designs inspired by the ancient Aztec architecture and murals. The ball was called Azteca. Italy followed suit in 1990 with The “Etrusco Unico”, the ball displayed fine art inspired by ancient Italian artwork from the Etruscans. In 1994, Adidas went “Questra”, in search of the stars. They aimed at perfection. The United States put their mark on the ball with a logo reflecting space age technology. This was not only a nod to the technological innovations on the physical ball itself, but it was a way of celebrating the host nation’s legendary Apollo 11 mission. In France 1998, Adidas created their first multi-color ball which deviated from the usual black and white colors. It was appropriately called “Tricolore” in reference to the three colors of the French flag which were represented on the ball. In 2002, Japan and South Korea named the ball “Fevernova”. This ball was revolutionary in color and design. It did not only depart from the Tango style of balls known for its three pointed shapes which connected each hexagon, it was also different in terms of color. The design and colors on the ball reflected Asian culture. But more importantly, it was the first time the FIFA World cup was being played away from Europe and the Americas. It was also the first time it was being hosted jointly by two nations thus broadening the scope of the game from a geographical and cultural perspective. Enter the Germans in 2006 and they seemed to be echoing the Japanese and South Korean team effort by reaffirming what we had always known- soccer/football is a team sport. That is the way the Germans play it and that may be why they play it so effectively, so without fanfare they named the ball “Teamgeist” which means team spirit”. The Africans in their wisdom even took it further to include the fans and everybody else; the South Africans named the 2010 FIFA World Cup ball “Jabulani” meaning “celebration”. Indeed the world cup is a celebration of the whole world. It is the most watched sporting event in the world and brings even warring nations to co-exist without rancor for over a month. Consequently, when Brazil turned back the arms of the clock by claiming the ball was “Brazuca”, a fellow Brazilian, they had not only killed the global celebration enveloping the world tournament, they had displayed their unbridled pride and annoyed their God. If God is Brazilian as the Brazilians claim, then the Brazilians erred by reducing their God into a round piece of leather meant to be kicked around by everybody. The World cup ball should not have been named “Brazilian”; it should have carried a name that embodied an aspect of Brazil. To claim God is Brazilian and name the ball Brazilian invited the wrath of the Brazilian God. The thrashing of Pentacampeões (The Five Time Champions) 7-1 by the Germans was an act of Grace sanctioned by the soccer Gods. Brazil needed to be humbled. The third place game happened on July 12, 2014 and Brazil lost again, 3-0 to the Netherlands. I hope the team and country have experienced “anagnorisis”, another word from ancient Greece meaning “recognition” often used for that moment in a Greek play when the hero becomes aware of his real situation. It is usually a change from ignorance to knowledge. Hopefully that knowledge can translate to a reconfiguration of the collective Brazilian psyche. Brazil does not own the game of football even if they contributed in making it jogger bonito! I remain one of their many fans. Article updated July 14, 2014 to reflect scores of the third place game.